The Tricking of Freya by Christina Sunley, a Mysterious Review. 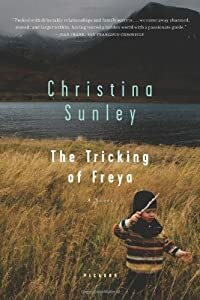 Review: Christina Sunley's debut novel, The Tricking of Freya, is the story of a young woman, told from her perspective, covering more than a 20 year span during which Freya Morris learns about her family and the secrets they share. Freya's ancestors, originally from Iceland, abandoned their homes in 1876 after a ravaging volcano erupted destroying their village with ashen lava. Her grandparents their immediate family journeyed to Canada and settled in Gimli (Icelandic name for Heaven) on the shores of Lake Winnipeg. Freya's parents subsequently moved to Connecticut. Her father died before she was two years old. She was seven before her mother took her to Gimli to meet her grandmother (Amma) and her Aunt Birdie (Ingibjorg). That summer Aunt Birdie taught Freya Icelandic words and phrases; she was a quick study. Birdie also told her of her grandfather, Olafur, who described their people's emigration from Iceland in poetry. Soon Freya was able to recite her grandfather's momentous poems much to the delight of Birdie. Freya eagerly looked forward to their visits in Gimli. She loved being with Aunt Birdie, except when Birdie was acerbic and had spells of being downcast. The summer when she was thirteen, Birdie deceived Freya by telling her that she, her mother and grandmother had planned a big surprise for her: a plane trip to Iceland. Actually Birdie took Freya to Iceland without telling anyone. There Birdie stole a jeep from a friend and drove miles through the wilderness, seeing waterfalls, craters, vast lava fields and green lava moss, and a multitude of sheep. Freya experienced a whole world, both beautiful and frightening. It becomes a vital part of her lengthy letter from which this story is actually told. Years later, during one of her trips to Gimli, Freda overhears a conversation regarding a child Birdie had given birth to when she was young. Although no one would admit it, Freya is positive that her aunt Birdie had a baby out of wedlock. If she is right then she has a cousin somewhere. Freda gives up her home in mid-Manhattan and her job as a photographer and heads to Gimli to find her cousin. Finally her grandmother's nurse, who had also been Birdie's nurse, admitted that Birdie indeed had a child. She gave it up in a "blind adoption". The adoptive parents would never know who gave birth to the child and Birdie would never know who adopted it. Believing that Birdie would only give her baby to an Icelander, Freya returns to Iceland to continue her quest to find her cousin. The Tricking of Freya is not a mystery novel by any standard definition, but it is a story filled with myriad twists and turns. It is in many ways a literary maze filled with the unexpected around every corner. The author's beautiful descriptions of Iceland, the country's waterfalls, volcanoes, icebergs, and more are incredible. The reader is drawn into Freda's ancestral lore and the search for her cousin, accompanying her on her journey and participating in an adventure that can best be described as mesmerizing. Special thanks to guest reviewer Betty of The Betz Review for contributing her review of The Tricking of Freya. Acknowledgment: Susan Schwartzman Public Relations provided a copy of The Tricking of Freya for this review.